The uses for the Seek Thermal camera are limitless, making the product a true game changer. From seeking an intruder in pitch dark, to finding heat leaks in your house, to a hunter searching for game in daylight or darkness through brush. In broad daylight or complete darkness, you can now detect levels of hot and cold, water leaks, and more. You can see things like your dog's heat inprint on your couch where he was lying down just minutes ago, and even his foot steps where he walked away. This thermal camera will be great for both home and Bug Out location security, and for property surveillance and reconnaissance. The Seek Thermal Imaging Camera is small and attaches to your smartphone's USB port. The setup is very easy. Just download the free smartphone app and plug the camera into your phone's USB port. The Seek camera detects infrared light and creates a visible image on your smartphone's screen. The camera works in daylight or complete darkness. Here is a list of some of the things you can do with a Seek Thermal camera. Possible concealed weapon detection. In the image of the guy above with the assault weapon, if that guy had a gun under his shirt, it would give off less heat and would look darker. Any kind of gun harness worn across his shoulder or chest would likely be visible as well. So you might be able to spot someone in your house or out in public with a weapon, especially a large knife or pistol. Hidden compartments in walls and in cars. The different materials of what is being hidden out of sight, may act as an insulator or vice versa and give off a different heat signature on the wall. If you live in an old house, for example, perhaps it has treasures or firearms hidden in the walls that you might be able to tell that there is definitely something behind this wall, like a metal or wooden box full of money or old coins. Seeing someone throw contraband or hide something in the dark. If you pursued someone in their car into a parking deck, their tire tracks and vehicle would be giving off a larger heat signal comparatively to cars that had cooled off to any degree. You might learn that one of your neighbors is possibly growing a lot of plants inside like marijuana (heat lamps). You can locate the source of leaking water pipes. You can spot natural gas or propane leaks. You can locate a clog in a drain pipe or sewer pipe. You can see where a draft is coming from. You can see where you need to add weatherstripping, insulation or caulk for your house. You can spot moisture problems in your home around windows, doors, walls, baseboards and more. I had water leaking in my chimney into the boards behind my wall and my termite guy spotted that when he was checking my baseboards with his thermal camera. You can see a failing electrical switch or damaged wire. You could see excess heat build up before it fails and possible causes a fire. You will know where a frying pan or grill is too hot or cold. That would be helpful before you throw your steaks or hamburgers on the grill. In a fire, you can see through smoke. Firefighters use them to quickly locate people who are trapped. So if you have this mounted to your phone and run across a house fire, you might be able to save someone's life. You can inspect mechanical devices to make sure they are not overheating. See things with the Seek Thermal Camera that you normally cannot see like the heat imprint from footsteps. Compact Pro - High-Resolution Thermal Camera for Your Smartphone. Important Note: The Seek Thermal imaging camera comes in two versions (one for Android smartphones and another version for iPhones), so make sure that you purchase the correct version. See the link immediately below and scroll down on the page to see a list of compatible smartphone models, and also a list of known devices the Seek Thermal camera is not compatible with. "With all the combinations of device models and software variations, confirming device compatibility for Android is a daunting task. 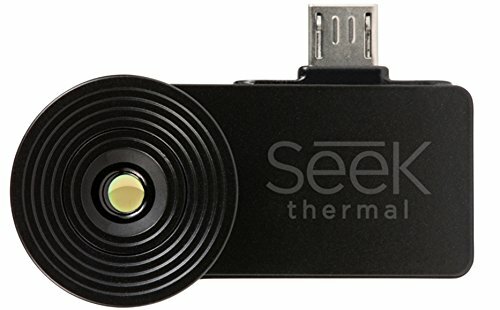 There are a handful of key requirements that your device must meet in order to run the Seek Thermal camera and app. Given the variations that some mobile carriers and device manufacturers implement on Android phones, we cannot guarantee support. But the following list offers good guidance. Micro-USB port - The port used to charge your phone or connect it to a computer must be the small, flat looking USB connector. Micro-USB position - For optimal use the camera attachment should point away from your phone's screen. If the wider portion of your USB port aligns with the back of your phone, your port is compatible. If the port is reversed, you may still be able to use the camera with a micro-USB extension cable or adapter. Powered USB On The Go - Not all Android devices can run USB peripherals. Your phone needs to not only be able to connect to a USB peripheral, but also provide limited power to the device. If you can connect a thumb drive or portable hard drive (that doesn't also plug into the wall) you should be good to go." The following YouTube video from Seek Thermal explains the Seek Thermal Imaging Camera very well. The following YouTube video is from Canadian Prepper and provides a demo of the Seek camera on his Android phone. At the 13:58 mark, you can see where he is observing people from at least 120' away. The following YouTube video clearly demonstrates the advantages of a Thermal Camera versus Night Vision optics. "Amazingly good for the price!" "This is an incredible value compared to an industrial FLIR unit. I could see entire issuing these as standard a standard equipment for maintenance or engineering groups at industrial facilities--even if the only use is to flag trouble areas for someone to come back out and inspect with the $10k thermal camera...."
"What a great product!! So glad I found it. It sure fit my budget! Higly recommend it! Other Imaging cameras were to expensive...."
"Good bang for your buck. I had to change (upgrade) my phone from the Samsung s3 mini to a samsung S5 in order to get the camera to work. Storage case is robust. Imaging is pretty good, considering the low cost. I am able to demonstrate heat loss and cold air infiltration. It also helped identify a wet ceiling area due to a roof leak." "Great camera for what you pay, very useful for a handyman or just as a toy, but not nearly as sensitive as the higher end FLIR stand alones"
"Awesome, Like a FLIR! Just about like a FLIR, but smaller and cheaper. You can learn a lot about what going on with electronics that you just cannot see otherwise. $200 well spent. They also have a telephoto version, I got that too, love them both!" "Just buy it! Look - it's $250. Even "semi-professional" IR cameras that cost 4x the price only have 70 x 90 pixels - this has 156 x 206 pixels. So OK, it's still not like watching heat in HD, BUT IT'S $250!!! And You can take it wherever because it weighs ounces. They used to have to fill thermal imagers w/liquid helium to make them work! Now U can casually walk down the street and see exactly HOW MUCH energy is being dispelled by everything around U - and it's A LOT! Pot growhouse? Oh, over there. Where's the plumbing in this wall? Oh! There it is. Waitress brings Ur cold eggs and everyone else's are hot? Show her! "Nope, haven't driven it all day" - then why's it hot? AND U CAN RECORD IT ALL TO MEMORY, STILL OR MOVIE!!! C'mon - what's not to like? Pls support these guys - I bet they'll have it in HD in a few years! Very satisfied." "Really like the seek thermal. As good as or better than Gen 1 units costing a lot more. Easy to set up and very useful. I cn't match the advertised range but I can see my neighbors horses at about 600 ft. Not as horses but as large heat sources. At about 400 ft I can see that they are definitely horses. Well worth the money. I bought it as a toy but it has really turned into a tool." "Amazing, works great finding heat leaks in metal building." "This is awesome! For the price, it is a great little IR Camera and beat the cost of a full size one!"